Univolt internals - which fuse is which? I spent some time this weekend examing the electrical systems on our new (to us) 1971 Tradewind. Most everything works when I hook up the 120VAC line, but there's no juice w/ just the batteries. A couple of the fuses in the Univolt IV blue box were obviously bad, but replacing them doesn't help. Others may need replacing as well; I've not yet checked each one. I cannot read the piece of paper on the inside of the Univolt that supposedly explains which fuse does what - does anyone have a photo or scan of the original manual? There's probably a converter in my future - and we're definitely moving the dual 12V batteries the PO had loose under the bed(!) - but right now I'd like get things figured out w/ the existing system. My be that my univolt is an older style than yours. This is the 12 volt distribution used in my 75 Trade Wind. It sows the connection from the battery as well as all the circuts to the trailer. I don't remember any "screw in fuses" on the 71 Univolt. Note there are 2 or 3 40 amp fuses. The one for the trailer battery is the one I would start with. The 40 amp fuses are very hard to find. There are several different configurations in 70s Univolts. 40 amp fuses are in both large and smaller sizes. I use a 40 amp resetting circuit breaker that fits into the fuse holder. 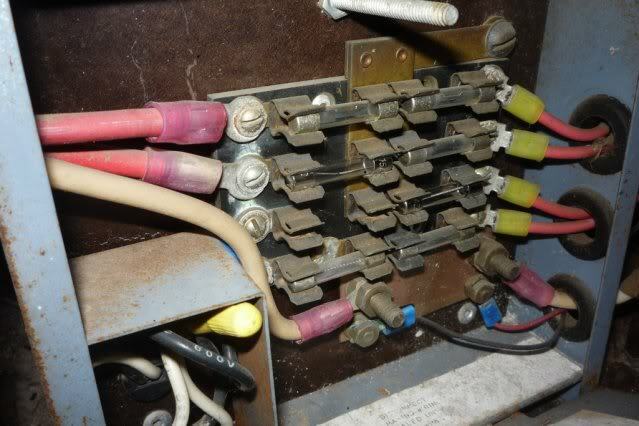 A photo of your fuse panel would help. The 1965 Airstreams, except for the Caravelle's used a battery charger called a "Constavolt". It indeed had a couple of screw in fuses. It was also very large in size, but Airstream buried it under the bathroom closet. I am amazed that someone still had one, especially one that's still working. That just proves, that everything old, is not always bad. So I've mostly puzzled this out w/ the diagram posted by azflycaster. Here's a photo; youi can see the fried battery fuse. The only one I'm still figuring out is the lowest fuse on the left, but that just needs some experimenting. Did you ever discover what the lower left fuse went to? The reason I ask is I have the same Univolt and I get continuity to the battery with every fuse except the lower left. That fuse is for the remote ammeter. I have a simalir problem. My univolt wont power up unless i jump the bottom two fuses together. What could my problem be? ?